Extreme Marquees is Australia’s premier supplier of outdoor promotional pop up marquees and pop-up gazebos. Extreme Marquees has been distributing marquees Australia wide for over 10 years. During this time, we have developed a range of gazebos and marquees that fit every budget and application. From recreational use through to heavy duty commercial, Extreme Marquees has the right outdoor marquee or gazebo tent for you. Extreme Marquees offers the largest range of pop up tents, marquees and gazebos in Australia. Extensive designs and development have been undertaken to ensure ease of operation and maximum lifespan. Engineered to meet Australian standards, our ranges of folding marquees and pop up tents have full structural certification. Commercial fabrics used to make our marquee canopies have Australian certified levels of flame retardant, UV radiation inhibitors and waterproofing agents. Our frames are made from high-grade commercial aluminium or powder-coated steel and are individually checked as a part of our quality assurance program. Our extensive range of marquees and outdoor gazebos below has been developed to meet any need and every budget. Unique options include coloured anodised aluminium frames for professional exhibitors and a patented clip-on wheel system for easy set up. A large range of accessories are also available including canopy peak flags, portable awnings, locking bar systems, yellow steel safety weight plates and sand bags. Our marquee sales consultants can recommend the right portable pop up marquee or gazebo to suit your requirements. The True Blue Marquee range is ready for anything the tough Australian climate can throw at it! The 45mm hexagonal leg profile is made from commercial grade steel and powder coated blue. The True-Blue canopy is made from our highest-grade PVC coated polyester and will easily out last any comparable competitors’ product. Optional accessories include a printed detachable valance and portable awning. The 45mm Velocity gazebo range features ultra-light 45mm profile aluminium hexagonal legs. Our team of engineers have created a unique balance between the strength in the hexagonal leg design and the lightweight aluminium profile. The Velocity range is perfect as an affordable aluminium marquee that is also the lightest marquee in our range. Roofs are PVC coated polyester and available in 8 vibrant colours or can be custom printed. The Extreme Marquees Tectonic Pop Up Marquee has been developed for extreme conditions. Built with 57mm hexagonal T5 6005 legs, oversized truss bars and extruded connectors with advanced synthetic internal sliders, the Tectonic is the heaviest duty folding marquee on the Australian market. The frame features numerous advancements in technology culminating in smooth seamless functionality. Our patented clip on wheel system is recommended for this range. The Super Heavy Duty Advanced Q8 Quasar Gazebo Range feature an al- aluminium frame forms the platform of the most technologically advanced and innovative instant frame in the world. Based on advance tetrahedral geometry the advanced Q8 Quasar offers the cutting edge in design and functionality. The Q8 Quasar is as stunning as it is strong. The unique profile offers superior strength over many other conventional geometries at a reduced weight. The four-groove channel provides a new streamline method to attach slide-in walls, half wall bars, aluminium partitions and a variety of other professional exhibitor gazebo accessories. The advanced V-edge truss bars and moulded cast aluminium connectors offer superior strength and unique functionality. The new Super Heavy Duty Q8 Quasar is the most futuristic, functional all-aluminium frame on the world market to date. The new True Blue Marquee range is ready for anything the tough Australian climate can throw at it! The 45mm hexagonal leg profile is made from commercial grade steel and powder coated blue. 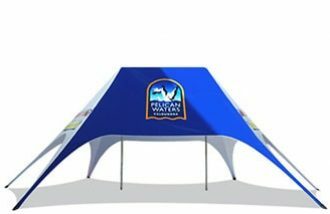 The True Blue canopy is made from our highest grade PVC coated polyester and will easily out last any comparable competitors product. Optional accessories include a printed detachable valance and portable awning. The 45mm Hex-A features ultra light 45mm profile aluminium hexagonal legs. Our team of engineers have created a unique balance between the strength in the hexagonal leg design and the lightweight aluminium profile. The Hex-A range is perfect as an affordable aluminium marquee that is also the lightest marquee in our range. Roofs are PVC coated polyester and available in 8 vibrant colours or can be custom printed. The Extreme Tectonic Range has been developed for extreme conditions. Built with 57mm hexagonal T5 6005 legs, oversized truss bars and extruded connectors with advanced synthetic internal sliders the tectonic is the heaviest duty folding marquee on the Australian market. The frame features numerous advancements in technology culminating in smooth seamless functionality. Our patented clip on wheel system is recommended for this range. The Super Heavy Duty Advanced Q8 Quasar all aluminum frame forms the platform of the most technologically advanced and innovative instant frame in the world. Based on advance tetrahedral geometry the advanced Q8 Quasar offers the cutting edge in design and functionality. The Q8 Quasar is as stunning as it is strong. The unique profile offers superior strength over many other conventional geometries at a reduced weight. The four groove channel provides a new streamline method to attach slide in keder walls, half wall bars, aluminum partitions and other professional exhibitor accessories. The advanced V-edge truss bars and moulded cast aluminum connectors offer superior strength and unique functionality. The new Super Heavy Duty Q8 Quasar is the most futuristic, functional all aluminum frame on the world market to date.